Bishop McGee was born in Greenock to Irish parents Seamus and Brighid McGee who moved to Scotland after their marriage in 1964. He attended St Joseph’s Primary School and Holy Cross Primary School, both in Greenock. After primary education he continued his studies at St. Vincent’s College, Langbank and St. Mary’s College, Blairs. Between 1983 and 1989, Bishop McGee studied for the priesthood at St. Patrick’s College, Thurles, County Tipperary, Ireland, where he gained a Certificate in Philosophy with Distinction and Diploma in Theology with Distinction. In 2011 he completed a Master of Arts degree in Christian Spirituality from Sarum College, Salisbury. On the Solemnity of St. Peter and Paul, 29 June 1989, Bishop McGee was ordained by Bishop John Mone as a priest for the Diocese of Paisley, in St. Mary’s, Greenock. 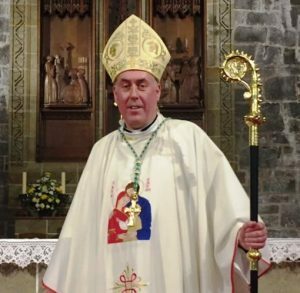 The Bishop’s first placement was as curate at St. Charles, Paisley (1989-1995) where he was also chaplain to St. Charles Primary School, St. Andrew’s Academy and Dykebar Hospital. 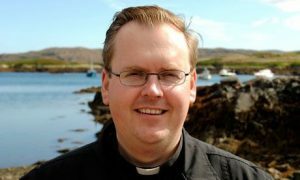 During 1995-97 he served as curate in Holy Family, Port Glasgow and chaplain to St. Michael’s Primary School. From 1997 to 2007 he was parish priest of St. Joseph’s, Clarkston and chaplain to St. Joseph’s Primary School and Our Lady of the Missions Primary School. He also assisted in St. Ninian’s High School. Bishop McGee was then appointed Spiritual Director at Scotus College, the Scottish National Seminary. After the closure of the National Seminary he returned to Holy Family, Port Glasgow in 2009, as parish priest. Here he was once more chaplain to St. Michael’s Primary School and to St. Stephen’s High School as well as part time chaplain for Inverclyde Royal Hospital, Greenock. Positions held by Bishop McGee in the Diocese of Paisley included Director of RCIA 1993-2003, Vicar Episcopal for Marriage and Family Life 2006-2014 and Vicar General of the Diocese of Paisley 2014-16. One of the great enrichments of the Bishop’s priesthood has been the opportunity to visit countries in the developing world. He has twice been to Africa and Chile to spend time with Paisley priests serving there. He also worked at the Live with Hope Centre at Kericho, Kenya, run by Sr. Placida McCann, a Greenock born member of the Franciscan Sisters of the Immaculate Conception. Four of these visits were with youth volunteers from his various parishes.